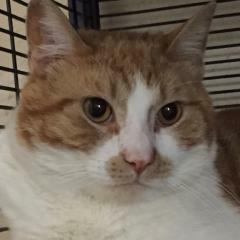 Butterscotch is a 1-year-old neutered male DSH Orange and White cat. He is a big, sweet, affectionate boy who follows you from room to room for attention. Good with other nice cats or happy as your one and only love. For more information on Butterscotch, please phone the shelter at (845) 564-6810.